Property owners and operators in California owe duties of care to protect people who are legally present on their properties from dangerous conditions. Property owners must either know about the existence of the hazardous condition or should know about it for liability to attach. They must take steps to correct hazards about which they know or should have known and to warn visitors to their property about their existence. In Lefebvre v. NC Valley Baseball, LLC, Stanislaus County Superior Court No. 2019247, the court considered the concepts of notice and of assumption of the risk in a case involving a man who was injured at a batting cage by a baseball. Craig Lefebvre was a 23-year-old coach for a team from NC Valley Baseball, LLC. On Jan. 21, 2016, Lefebvre was getting ready to leave the batting cage location in Modesto when he was stopped by a parent to talk. As Lefebvre stopped on the walkway between two of the batting areas, a foul ball flew through the protective netting and struck him in the groin. Lefebvre suffered a fracture of his right testicle in the incident. He underwent surgery on his testicle to try to repair the damage. The surgery resulted in his loss of almost half of the volume of the testicle and left him suffering from chronic testicular pain. 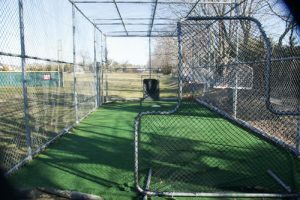 Lefebvre filed a lawsuit against the facility’s owner for negligence in failing to repair or to replace the netting under a theory of premises liability. The plaintiff argued that the netting was used and donated at the time of its installation in 2012. He also argued that the defendant did not have a net inspection schedule in place and that there wasn’t any tracking of repairs to the netting that were performed by the defendant. He also argued that the defendant had new netting available that had not been installed. There were no signs warning of the dangerous conditions, and it was uncontested that the ball went through the netting. Finally, he argued that the defendant should have installed double netting along the walkway and designed the facility improperly by placing the walkway between two batting lanes. The defendant argued that it was common knowledge that people should not use the walkway when active batting practice was going on in the two adjacent batting lanes. The defendant also argued that the plaintiff was 100 percent at fault in his own accident because of his years of experience with baseball. The trial lasted for eight days before the case was sent to the jury. The jury deliberated for 1 3/4 hours before returning a verdict in favor of the plaintiff in the amount of $600,000. The jury found that the defendant was completely liable and did not find that the plaintiff had any contributory negligence in the action. The jury assessed past economic damages in the amount of $18,000 and future economic damages in the amount of $104,000. They also awarded $100,000 in past non-economic damages and $378,000 in future non-economic damages. In California, property owners owe a duty of care to third parties who enter the premises to exercise ordinary reasonable care to keep the property in a safe condition. If people are injured by a hazardous condition that exists on the property, the owners may be liable if they knew about the dangerous condition or should have known about its existence and failed to correct it or to adequately warn others of its presence. Owners may be deemed to have constructive notice of the existence of a condition, which means that the condition is one that the owner should have known about. Owners will be deemed to have constructive notice of a hazardous condition if the condition is one that lasted for a long enough period of time that it should have been discovered by the property owner. The time period must be enough that the owner would have had a reasonable time to discover and to repair the hazard, protect visitors from being harmed by the condition or to adequately warn them of its existence. In this case, the faulty netting was used when it was installed four years before the incident. The parties did not dispute that the ball came through the netting. The defendant admitted that it did not have a schedule for inspecting the netting or a record of repairs that were made to it. There also were no warnings posted to warn visitors about the netting. In some cases, people will be deemed to have assumed the risk of injury by their participating in an activity. While the defendant tried to argue that the plaintiff assumed the risk of injury by stopping to talk to a parent on the walkway, the argument failed. In California, a plaintiff who is injured and who is deemed to have assumed the risk of injury by participating in an activity despite knowing of the danger may be deemed to have some comparative fault. In Lefevbre’s case, the jury found that he did not assume the risk and thus did not share any fault, allowing him to recover the gross amount that was awarded to him. Proving liability in a premises liability case can be complex. If you have been injured while you were visiting the premises of another or of a business, you may benefit by getting help from an experienced personal injury lawyer in Los Angeles. An attorney may help you to gather evidence that a condition existed for a lengthy period and that the property owner should have known or did know about its existence. Your lawyer may be able to build a strong case so that you might be able to reach a reasonable settlement without having to go to trial. Contact a Los Angeles personal injury lawyer who has experience with premises liability cases today.